River Valley’s Wyatt Halfhill (right) slides into second base in front of the throw from Cory Cox (11) to Tyler Tillis (2), during the Marauders’ 10-run win on Wednesday in Rocksprings, Ohio. ROCKSPRINGS, Ohio — One team was going to get its first win of the season, the only question was which one. 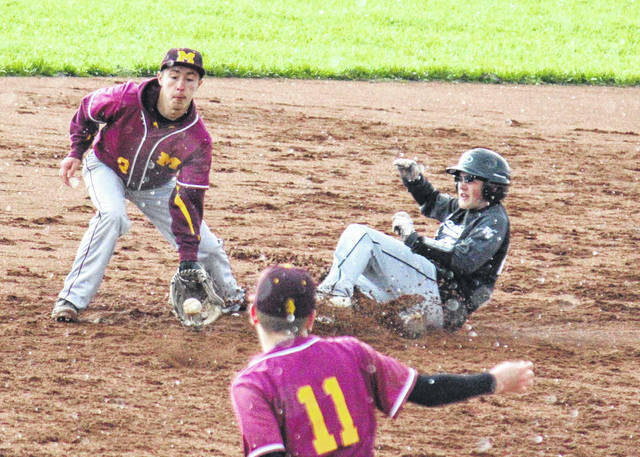 The Meigs baseball team made sure it was the squad to taste victory first, as the Marauders defeated Tri-Valley Conference Ohio Division guest River Valley by an 11-1 count in six innings on Wednesday in Meigs County. Meigs (1-2, 1-0 TVC Ohio) wasted little time breaking the scoreless tie, as their first two batters of the game, Cory Cox and Cole Arnott, scored in the bottom of the first inning. Attempting to add on in the home half of the second, Meigs had a runner throw out between third and home, leaving the score at 2-0. After being retired in order in each of the first two innings, River Valley (0-2, 0-2) got on the board in the top of the third when Blaine Cline drew a base on balls and eventually scored on a wild pitch, bringing the Raiders within one. The Maroon and Gold batted around in the bottom of the third, however, scoring four runs on five hits and two walks to increase the lead to 6-1. The Raiders stranded two runners on base in the top of the fourth, but didn’t make it into scoring position in the fifth or sixth innings. 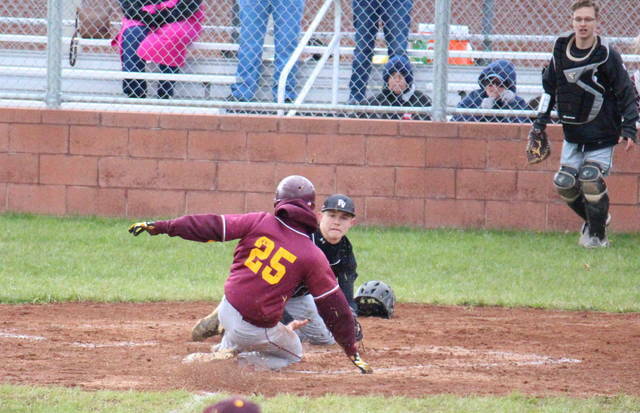 Meigs added one more run to its advantaged in the bottom of the fourth, as Arnott scored on a bases loaded walk. River Valley escaped a bases loaded jam in the bottom of the fifth inning, but Meigs plated four runs in the sixth inning to take the 11-1 mercy rule victory. Briar Wolfe was the wining pitcher of record in four innings on the mound for the Maroon and Gold, allowing one run on two hits and three walks, while striking out eight. Zayne Wolfe pitched the final two frames for MHS, allowing one hit and striking out five. Jack Farley suffered the loss on the hill for RVHS, surrendering six runs on eight hits and two walks, while striking out two. Chase Barber pitched the next 2⅓ innings, allowing five runs, three hits and 10 walks, while striking out four. Seth McDonald recorded one out on the mound and walked two batters. Brentten Young led the MHS offense, going 2-for-3 with a double, a run scored and three runs batted in. Cox singled twice and scored three runs, Zayne Wolfe singled twice, scored once and drive in two runs, while Arnott singled once, scored twice and drove in one run. Zach Helton and Wesley Smith both singled once and scored once for the Marauders, with Helton driving in one. Briar Wolfe and Bryce Swatzel both singled once, with Wolfe earning a pair of RBIs, while Matt Gilkey and Tyler Tillis both drew a base on balls. Farley, Andrew Mershon and Joel Horner each singled once for the Raiders, with Cline scoring the lone run for RVHS. Both teams had one error in the contest. The Raiders stranded four runners on base, while the Marauders stranded 10. The Marauders and Raiders are scheduled for the rematch on April 18 in Bidwell. Meigs will be back in action on Friday when it hosts Vinton County. The Raiders are slated to take the field at home on Monday against Athens.